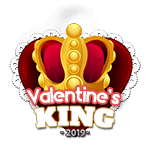 on being crowned the King of Valentines for collecting 13,342 hearts! Enjoy your special badge! Throughout the Valentine's Celebration, our models will offer special scheduled shows in honor of the sexiest day of the year! Expect to see hearts, halos and tons of red leather as our amazing cam guys celebrate the season of love!